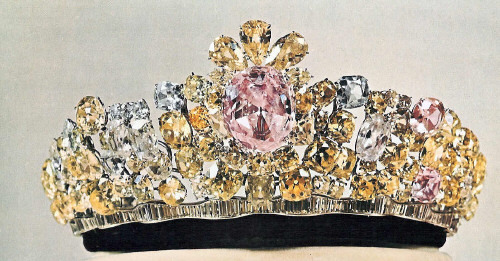 The centerpiece of this tiara is the Nur-Ul-Ain Diamond, one of the largest pink diamonds in the world. The diamond is thought to have been brought from India, along with the Darya-I-Nur Diamond. The diamond is set in platinum, and is surrounded by diamonds in shades of pink, yellow, and colorless, with a row of colorless baguette diamonds in tapering sizes lining the base of the tiara. The Nur-Ul-Ain is an oval brilliant cut of around 60 carats and measures approximately 30 × 26 × 11 mm. The other diamonds range from 14 to 19 carats each. The tiara contains 324 diamonds total. The tiara was designed by Harry Winston for the occasion of the Empress Farah's wedding to the the last Shah of Iran, Mohammad Reza Shah Pahlavi, in 1958.